This week when I went into the Field Museum, Dave Willard had set aside two woodpeckers to work on; each interesting (and beautiful) in its own right. The first was a Pileated Woodpecker. I had worked on a Pileated before, but this was unique in that it was collected in La Grange, IL. Typically these are denizens of old growth forests, and you would be hard pressed to find them in Cook County. You would be much more likely to spot one in Wisconsin, Minnesota, or down in Southern Illinois near the Cache River, or areas along the Mississippi (Mississippi Palisades). They need old trees, with large circumferences to support their nesting cavities. This specimen was a female (looks like she had died from a head wound, as her skull was cracked) that was found in the Desplaines River corridor. La Grange being an "older" suburb may have some suitable habitat for Pileateds. 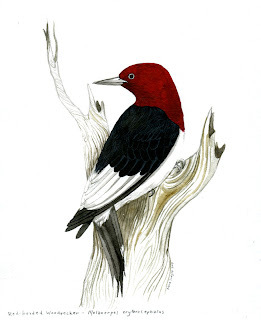 The other specimen I prepared was a Red-headed Woodpecker. I just had one pay a visit to my backyard last week for a couple of days. It would forage on the ground. Their large, bold patches of red, black, and white, create a striking appearance. 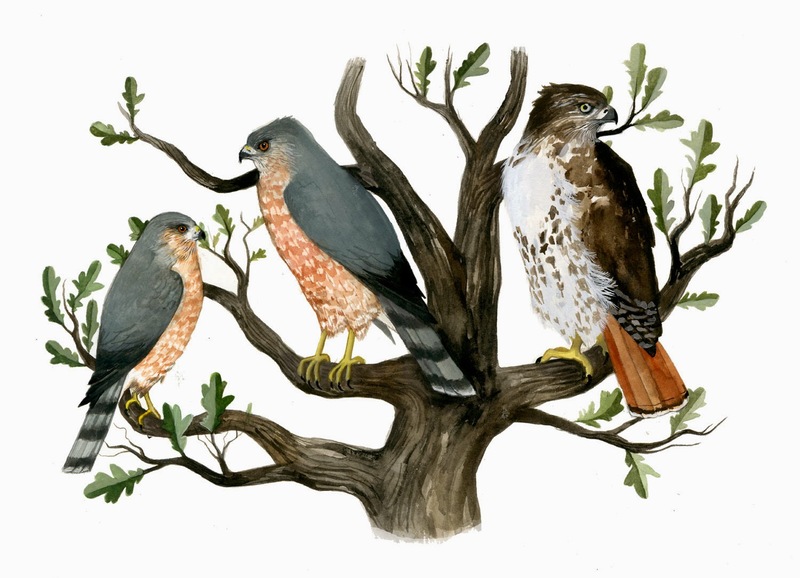 There is no difference in plumage between males and females, and so they are indistinguishable in the field. According to the Birds of North America site, for such a conspicuous bird, surprising little is know about it. Part of the reason for lack of data, is its preference for nesting in precariously located spots in old snags, and dead branches. Recent declines in numbers were initially being linked to nesting competition from starlings, but recent studies have shown that there actually may be no direct link between the two. This painting is available in the Etsy shop. Have a great holiday weekend! This is a lovely image of a redheaded woodpecker. These are plentiful in Missouri state parks. One park we often visit, Knob Noster S.P., also has pileated wood peckers. We often see them when we visit, and they frequently forage on he ground. They are terrific birds, looking more than a bit like pteradactyls (sp?). We have coyotes in our midtown KC neighborhood, actually. I have seen coyotoes on more than one occasion and neighbors who live closer to a local park hear them howl occasionally. I've also seen foxes more than once. One day, I was standing still in an open field west of our neighborhood when a fox came sauntering out of the woods nearby. When it was about 30 feet away, it suddenly realized I was standing there. It leaped straight up in the air and took off like a rocket. I couldn't help laughing.